Stylist Tip: Complete your casual style with boyfriend jeans and an open-toe bootie. Length: 22.5 in. front, 25.5 in. back. Bust: 36 in. Waist: 36 in. Sleeve: 7.25 in. I've bought mine in white and it's a little more see-through than I expected. That said, it doesn't change my mind on how cute this shirt is! I personnally like to wear it with the Charcoal Sheer Lace Bralette from dailylook, it fits great. It's really cute in the gray but it's LITERALLY as thin as tissue paper :( so I plan to wash it as seldom as possible and I will need to be extraordinarily careful not to snag it on anything. For $20 bucks I really hoped it would be a more substantial shirt that I could wear often. OH WELL it's still cute for the time being. a bit thin... but LOVE IT - might just buy one in every color! So comfortable and sits really nicely on the body. 5/5 for me!! Love these shirts! I've been looking for the perfect tee for a long time can't wait to purchase more. I bought the Green in a small, love it! I wish the XS was available, because that would fit better, I find myself having to readjust a few times to prevent the shirt from going so low, and I am normally an XS. But I am thinking of buying the white black and grey, just debating since the Small is alittle too big. 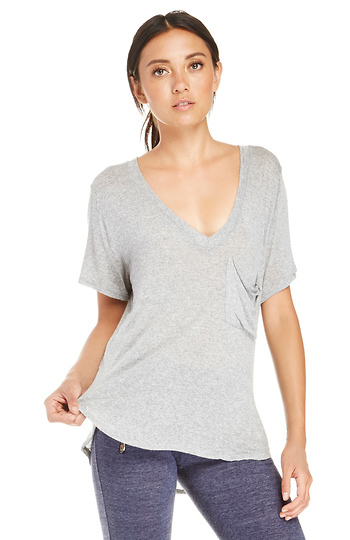 Perfect slouchy tee. Material is very soft. Drapes nicely. True to size. a bit thin, but love it. I have it in several colors. This is one of the best t-shirts I have ever owned. They are super soft and so comfortable. Yes they are a tad bit sheer but when wearing a cute bralette it adds a great look! I have them in every color and always get asked where I got them!